This week CIMSEC is running a topic week on Naval Humanitarian Assistance/Disaster Relief (HA/DR). Our audience replied to the call for articles with strong contributions featuring varied and in-depth analyses. Their writings explore the complex and urgent nature of HA/DR missions, the importance of demonstrating goodwill to the international community, and provide recommendations to better perform this key mission. We thank our authors for their contributions. Below is a list of articles featuring during the topic week. It will be updated as the topic week rolls out and as prospective authors finalize additional publications. Dmitry Filipoff is CIMSEC’s Director of Online Content. Contact the CIMSEC editorial team at Nextwar@cimsec.org. 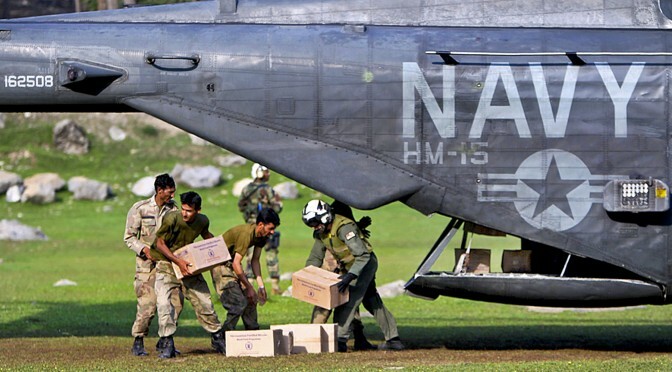 Featured Image: A U.S. Navy aircrew helps Pakistani soldiers load relief supplies aboard a U.S. Navy MH-53E Sea Dragon helicopter during humanitarian relief efforts in Pakistan’s Khyber-Pakhtunkhwa province, Aug. 21, 2010. The U.S. crew, assigned to Helicopter Mine Countermeasures Squadron 15, is embarked aboard the amphibious assault ship USS Peleliu to support the Pakistan government in flooded regions of Pakistan. U.S. Marine Corps photo by Capt. Paul Duncan.